The Rock Height: 6'5" Weight: 275 pounds From: Miami, Florida Favorite Quote: "Know Your Role!" Finishing Move: The Rock Bottom Setup Move: The Peoples Elbow Career Highlight: World Wrestling Federation Champion (3) Intercontinental Champion (2) The Rock is a third-generation superstar with immeasurable athleticism--and cockiness to boot! After graduating as an All-American football star from the University of Miami, Rocky Maivia entered the World Wrestling Federation and quickly became the Intercontinental Champion. Just when The Rock was becoming one of the most popular superstars in the Federation, he revealed his hatred for the fans and joined Shane and Vince McMahon at Survivor Series. Under controversial circumstances, The Rock won the World Wrestling Federation Championship at that event. 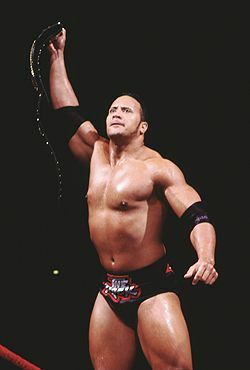 The Rock went on to win the title two more times, each time in equally contentious fashion. But what�s done is done. The "Great One" is a three-time Federation Champion. He�s a gifted athlete, he�s gifted on the microphone�he�s simply a gifted entertainer. And from the Rolex watch to the $500 shirts to the eyebrow and the Corporate Elbow, The Rock is just plain cool. Whether he�s a champion or a contender, a fan favorite or the most hated superstar on the roster, The Rock is a 27-year-old phenom. He�s already the "Most Electrifying Man in Sports-Entertainment," and when it�s all said and done he may go down in history as the most decorated, well-known and renowned superstar the Federation has ever known. then click the 'Join List' button.